AMD has announced the new 6th Generation A-series processors previously codenamed “Carrizo” and built on the 28nm fabrication technology. Three new Carrizo family A-Series models are announced – A8, A10, and FX – for the notebook platform. These new mobile chips promise twice the gaming performance and two times the battery life against the Intel’s offerings. The new AMD A-series processors pack 12-computing cores which include 4 CPU cores based on the Excavator microarchitecture and 8 GPU cores based on the 3rd Generation Graphics Core Next architecture. The new A-series aim to deliver the premium level Windows 10 experience along with the support for new DirectX 12 graphics standard. The Carrizo A-Series promises improved CPU performance even though it occupies 23% less die area and consumes 40% less power. The new APUs support HEVC/H.265 for higher quality streaming at a lower bandwidth for up to Ultra HD resolutions. You can enjoy twice the more viewing hours on a single charge compared to the predecessor Kaveri lineup. The new Graphics Core Next architecture with 8 GPU cores should also boost gaming performance to match that of some Radeon R7 discreet mobile graphics processors. 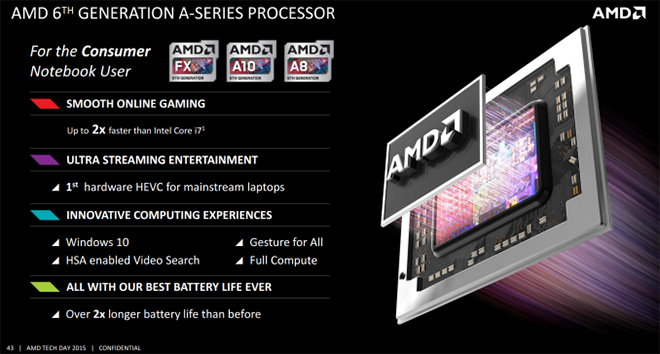 In coming few months, laptops packing the new Carrizo A-series APUs will be offered by Asus, Acer, Lenovo, and Toshiba.